Humanity has come a long way from the times of fishing with a line and bob. But despite advances in spaceflight, digital technology, and democracy, we have not yet managed to genetically engineer fish to lose their fear of motors. Even a clumsy paddle stroke will scare off wary lunkers. What's more, if you're paddling, you sure aren't keeping ahold of your rod. For these reasons, the pedal drive kayak is a real haiku of an invention: it's simple and efficient. Among pedal drive kayak's the Perception Pescador Pilot 12 clocks in solidly above average. The word pescador is Spanish for fisherman. That makes sense to us. But not all pescadors para los peces with the same herramientas. Here's a rundown of what kind of lures you'll find in the Perception Pescador Pilot 12's tackle box. The most obvious and important feature of the Perception Pescador Pilot 12 has already been introduced. The pedal drive allows you to cruise around almost noiselessly by pumping your feet and getting a prolonged, low-impact lower-ab workout. But don't expect to impress too many ladies with a hot post-fish beach bod, this pedal drive is seriously easy to operate. With a little fiddling with chair placement and angle, you should be able to navigate waters far more efficiently than with a paddle. What's more, this thing is so quiet. You could paddle around a dozen floating, sleeping babies without causing a stir. With boat traffic the way it is on many lakes and rivers today, fish are going to want to make friends with this kayak. To transition between lake and land/truck/storage, the drive easily pulls up or drops down. It's held in place with a pin and, if you want to take some strokes with the paddle to impress the ladies on the way home, just pull it up and set your rudder straight. This seat might fit an Admiral more aptly. It's super comfortable, very adjustable, and has a mesh back to increase airflow on days when the heat and humidity strike. If you're worried about varied fish swimming patterns or an attack from the Soviet submarine the Red Oktober, you're going to want to hook yourself up with some sonar technology. You won't have to do any jerry-rigging with el Pescador. You're powering this kayak with your legs, so steering is different with this guy. As you sit in the kayak, you will find a small lever on a pivot to your left. This controls the rudder behind you. For someone who's never operated a pedal drive kayak before, it can feel a little strange, but it shouldn't take long for you to get up to speed. That said, navigating twisting rivers can be a headache with this feature. Another huge bonus with the Perception Pescador Pilot 12 is the storage capacity. In the bow, you've got a mesh covered tankwell beyond your feet. Closer to the middle, just beyond the pedal drive, sit two waterproof storage pods. The main tankwell lies behind the captain's chair. It's covered by bungies and, for a single kayak, it really offers a lot of space. Just behind the seat sit four rod holders angled so that they cross behind your back. The good news is that they're big enough to hold a beer. The bad news is that they're big enough to hold a beer—rods don't sit very snugly within. On your left and right, you will find two gear tracks. Whether you want to mount a tether, a cell phone holder, a fish finder, a GoPro, or a fresh bouquet of flowers, these tracks will serve you well. With some fishing products, a rundown of the features doesn't do a great job of describing how well it works. By and large, that is not the case with the Perception Pescador Pilot 12. We gave this guy an A- for a reason: it holds up under scrutiny. We've said it before: this kayak really stands out for its pedal drive feature, especially considering the cost. Pretty much all trusty YouTube reviewers agree with this consensus. It's very efficient and very quiet. As Ty from the YouTube channel 30milesOut demonstrates, the pilot drive easily goes both forward and backward. "That's really handy for throwing baits, especially bass fishing or any kind of dock fishing like I do in this bayou," Ty says. "You can really hold your position." It also helps with maneuvering, avoiding unforeseen deadheads, and navigating reedy spots. One aspect not widely advertised with the Perception Pescador Pilot 12 is that, buying from most places, you will have to install the drive yourself. As YouTuber Joe Knows Fishing points out, this process leaves room for error. It's important to install all the hardware correctly and with sufficient torque, otherwise performance will suffer. It should also be noted that, as amazing as the pedal system is, it's not something that you should rely on 100%. There's no knowing what kind of deadheads or waterlilies lie just below the surface. Definitely don't forget to bring your paddle every time you head out just in case something goes wrong. Another overall ensemble that sings a pretty tune is the storage capacity. This vessel is by no means bigger than average: it stretches 12' 5" in length and 33.75" in the middle. But even with all the gear an enterprising pescador could need, you'll still be able to find room for a couple cold ones. In terms of weight capacity, you could haul in a chubby sturgeon with this thing. The Perception Pescador Pilot 12 is rated for 475 lbs. in total. Following size comes the feature of stability. Again, this kayak is not especially wide. But as YouTuber Aliex Fishing TV demonstrates, the kayak is wicked lake-worthy. "I guess you could make the kayak flip if you wanted to," says tester Miguel, "but it is very stable." Even standing up, it's going to take some serious wind and waves to put you into a tippy situation. The stability of this vessel can definitely accommodate a mildly excited, but well-trained dog and/or small child. One thing that many take issue with is the kayak's weight. It tips the scales at 85 lbs. That's not super heavy when it comes to kayaks, but in the interest of the muscular structure of your back, we recommend getting a cart to wheel this on or a pal to help you out when moving it. One potential headache about the Perception Pescador Pilot 12 is the rudder system. Compared to the innovation of the pedal drive, it's more of a compromise than a stand-out feature. YouTuber Thrill of Braziel notes that it can come loose without putting it under a huge amount of stress. No matter how well everything else is going, if you're caught out on the water with a loose rudder and no tools, you're not going to find the peace and serenity you seek. Make sure to check the hardware before you head out and ensure that all is right and tight. The only other minor issue reported by Thrill of Braziel was the rod holders: they really don't fit your rod very snugly. The casual trawler will definitely want to secure their stick in something more substantial mounted on one of the gear tracks. Slotted in at the top of the company's line of kayaks, the Perception Pescador Pilot 12 is king of the castle. It has all the best features Perception has to offer, which primarily includes the pilot drive, but also the tankwell capacity, transducer scupper and gear tracks. With high quality features also comes higher prices (compared to non-pilot drive models). Many other Perception kayaks are more affordable, but no other models come equipped with the pilot drive. The company offers two other sit on fishing models: the Pescador Pro, which has most, if not all of the other Pescador Pilot features minus the pilot drive; and the Striker, a more bare bones kayak which still has a solid amount of storage in the fore and the aft. 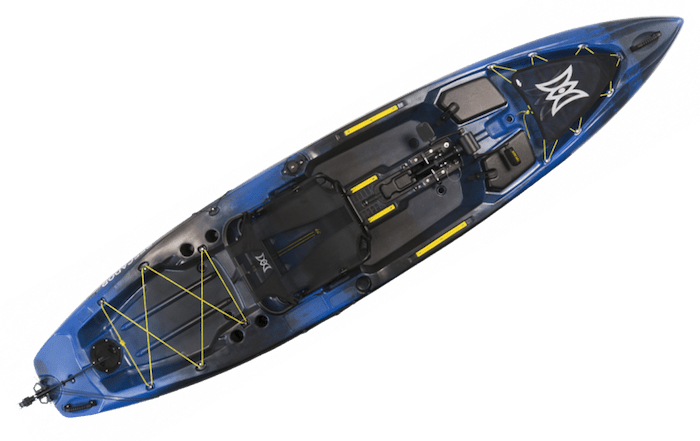 When it comes to other brands, there are a few other pilot drive kayaks that vie with the Perception Pescador Pilot 12 for top sit-on fishing kayak. One of these is the Native Slayer. This kayak is more expensive than the Pescador by several hundred dollars. That said, the Slayer is well known and established as a pilot drive model. The Perception is a newer model and it remains to be seen how well it holds up to heavy use. But as far as we can tell right now, the Slayer does not outperform the Pescador in any major way. They just have better brand recognition. See our Native Watercraft Slayer Propel 13 Review. Another major competitor is the Hobie Mirage Outback. Hobie created the first pilot drive kayak ever and, as such, has been developed for years longer than either the Slayer or the Pescador. This does not necessarily mean that they're the best either. For example, they did not develop the first reverse pilot drive—Native did that with the Slayer. Despite offering a similar product, the Mirage Outback is significantly more expensive than the Perception Pescador Pilot 12. That said, the Pescador beats the Mirage Outback in a few categories, such as weight capacity and total weight. In his video, Ty from 30milesOut said he felt the Pescador was more stable. See our ​Hobie Outback review. The company has put together a truly great sit on pilot drive kayak with its Perception Pescador Pilot 12. What's more, it's less expensive than any other model currently on the market. Often, that indicates lower quality, but with the Pescador, we believe that is not the case. We highly recommend this kayak and look forward to other developments Perception makes in the world of kayak fishing.